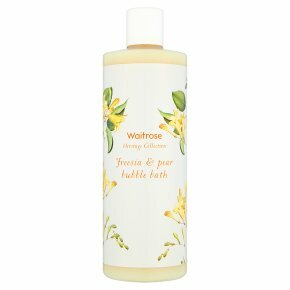 Our Freesia & Pear Bubble Bath opens with fresh green notes of freesia, and is balanced with sweet pear accords and subtle woody undertones, to create a nourishing bubble bath with delicate sweet notes. This is one of our signature fragrances inspired by our customers favourite flowers and crafted by our perfume house who have over 150 years of experience. Made in UK. BUAV approved. Aqua (water), Sodium Laureth Sulfate, Cocamidopropyl Betaine, Sodium Chloride, Glycerin, Cocamide DEA, Potassium Sorbate, Sodium Benzoate, Parfum (Fragrance), Benzyl Benzoate, Hydroxypropyl Guar Hydroxypropyltrimonium Chloride, Styrene/Acrylates Copolymer, Hexyl Cinnamal, Benzophenone-3, Disodium EDTA, Prunus Amygdauls Dulcis (Sweet Almond) Oil, Linalool, Tocopheryl Acetate, Citric Acid, Freesia Refracta Extract, Pyrus Communis (Pear) Fruit Extract, PEG-40 Hydrogenated Castor Oil, CI 19140, CI 42090.